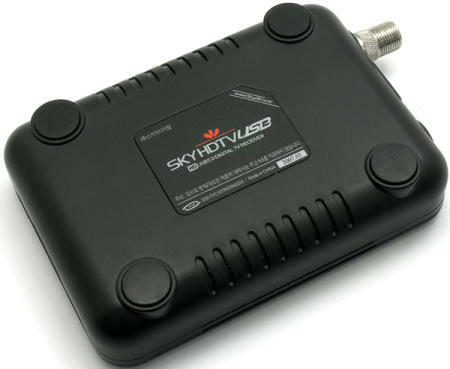 SkyDigital have launced its new SKYHDTV USB receiver, which is, well, an HDTV USB receiver (wonderfully original name!) The receiver plugs into your HDTV box (satellite, cable, even XBox360), and from there into your PC via USB, giving your PC the ability to record your TV programs in full HDTV. Now, when I first heard this I nearly spluttered into my coffee, as I wasn’t aware Sky was developing a small box that would let you record its HD satellite programmes onto your TV. 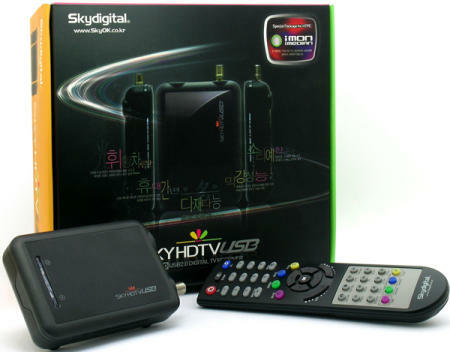 And, alas, it’s not, as it’s not Sky the satellite TV company, but SkyDigital, a Korean electronics firm. The upside of the SKYHDTV USB receiver is that it supports full HD, 5.1-channel surround sound, works with Windows Vista and comes with an electronic programme guide and time shift feature. The downside, of course, is that it’s only available in South Korea for Korean HDTV, for the price of KRW69,000. Bugger! I have cable at home for my TV, and one of the most annoying aspects of it is its complete inability to connect to my PC. I get my broadband through its Set Top Box (usually – this being the old NTL service, it’s not exactly 24/7! ), but other than that, I can’t pipe cable TV through to my PC for recording, PVR or time-shifting, and so can’t use any media center software to any great effect. I could if I had analogue TV, as there all sorts of analogue TV cards you can shove in your card for dirt cheap prices. Not so for cable TV supporting VirginMedia’s cable service though, and I can’t get analogue TV in my house (long story). Nuts! Now if the UK’s Sky would release a box like this, I’d convert to satellite in a shot. Until then, I’ll have to stick with VirginMedia. Marvellous! Pinnacle launches HDTV card in a USB stick!